Bacteria such as Escherichia coli and Salmonella typhimurium can utilize acetate as the sole source of carbon and energy. Acetate kinase (AckA) and phosphotransacetylase (Pta), key enzymes of acetate utilization pathway, regulate flux of metabolites in glycolysis, gluconeogenesis, TCA cycle, glyoxylate bypass and fatty acid metabolism. Here we report kinetic characterization of S. typhimurium AckA (St AckA) and structures of its unliganded (Form-I, 2.70 Å resolution) and citrate-bound (Form-II, 1.90 Å resolution) forms. The enzyme showed broad substrate specificity with k cat /K m in the order of acetate > propionate > formate. Further, the K m for acetyl-phosphate was significantly lower than for acetate and the enzyme could catalyze the reverse reaction (i.e. ATP synthesis) more efficiently. ATP and Mg2+ could be substituted by other nucleoside 5′-triphosphates (GTP, UTP and CTP) and divalent cations (Mn2+ and Co2+), respectively. Form-I St AckA represents the first structural report of an unliganded AckA. St AckA protomer consists of two domains with characteristic βββαβαβα topology of ASKHA superfamily of proteins. These domains adopt an intermediate conformation compared to that of open and closed forms of ligand-bound Methanosarcina thermophila AckA (Mt AckA). Spectroscopic and structural analyses of StAckA further suggested occurrence of inter-domain motion upon ligand-binding. Unexpectedly, Form-II St AckA structure showed a drastic change in the conformation of residues 230–300 compared to that of Form-I. Further investigation revealed electron density corresponding to a citrate molecule in a pocket located at the dimeric interface of Form-II St AckA. Interestingly, a similar dimeric interface pocket lined with largely conserved residues could be identified in Form-I St AckA as well as in other enzymes homologous to AckA suggesting that ligand binding at this pocket may influence the function of these enzymes. The biochemical and structural characterization of St AckA reported here provides insights into the biochemical specificity, overall fold, thermal stability, molecular basis of ligand binding and inter-domain motion in AckA family of enzymes. Dramatic conformational differences observed between unliganded and citrate-bound forms of St AckA led to identification of a putative ligand-binding pocket at the dimeric interface of St AckA with implications for enzymatic function. Bacteria respond to frequent changes in their environment by activating metabolic pathways that allow conversion of available nutrients into metabolites of central pathways. Utilization of acetate as a source of carbon and energy requires its initial activation to acetyl-CoA [1–3]. Sequential activities of acetate kinase (AckA, EC 2.7.2.1) and phosphotransacetylase (Pta, EC 2.3.1.8) result in the interconversion of ATP, acetate and CoA to ADP, acetyl-CoA and orthophosphate via acetyl-phosphate [4, 5]. In addition to being an important pathway for carbon flow, the AckA-Pta activity might control the cellular concentration of acetyl-CoA and acetyl-phosphate, which serve as important metabolic intermediates. Acetyl-CoA plays a central role in carbon metabolism [2, 3], while acetyl-phosphate acts as a global signal that regulates the function of several proteins involved in flagella biosynthesis and assembly, biofilm development, colonic acid biosynthesis and type-I pilus assembly [6, 7]. Studies on AckA from several organisms have shown that the enzyme is also important for xylose metabolism, phosphoryl transfer to enzyme-I of the phosphoenolpyruvate: glucose phosphotransferase system, periplasmic binding proteins and response regulator proteins of two-component systems [8–11]. Enzymes catalyzing transfer of phosphate group include wide-spread protein folds responsible for several indispensable cellular roles including signal transduction, molecular regulation and metabolic functions . Acetate kinase catalyzes reversible transfer of a γ-phosphate from ATP to acetate in the presence of a divalent metal ion . Similarly, propionate and butyrate kinases utilize propionate and butyrate, respectively, as preferred substrates for phosphoryl transfer from ATP to acceptor ligands [13, 14]. These enzymes are hereafter referred to as acetokinase family of enzymes (Pfam: PF00871; SCOP: 53080). Extensive structural and functional studies have been carried out for AckA from the archean Methanosarcina thermophila[15, 16]. An earlier study on AckA from E. coli suggested that in addition to its cognate substrate acetate, it could also phosphorylate analogous short-chain fatty acids (SCFAs) such as propionate and butyrate . However, in another study, AckAs from E. coli and S. typhimurium, which share 98% sequence identity, were found to be inactive with respect to propionate and butyrate . In the present study, we report the biochemical characterization and structures of S. typhimurium AckA (StAckA, NCBI accession: NP_461279.1, residues: 400, molecular mass: 43.3 kDa) in two crystal forms at 2.70 Å (apo, Form-I) and 1.90 Å (citrate-bound, Form-II) resolutions. Sequence and structure-based comparisons with homologous enzymes were carried out with the view of understanding their biochemical specificity, overall fold, stability, active site geometry, domain motion and plausible regulation. Recombinant St AckA (residues: 415, molecular mass: 45.0 kDa), cloned into the pRSET C vector, was overexpressed in E. coli and purified using Ni-NTA affinity and gel-filtration chromatography as reported earlier . Biochemical activity of St AckA was examined by two different methods depending on the direction of the reaction (acetyl-phosphate or ATP synthesis) [5, 9]. Acetyl-phosphate synthesis was monitored by coupling the reaction to the oxidation of NADH in an enzyme-coupled reaction using pyruvate kinase (PK) and lactate dehydrogenase (LDH). The standard assay reaction mixture of 0.5 ml contained 50 mM HEPES-NaOH pH 7.5, 20 mM sodium-acetate, 1 mM ATP, 10 mM MgCl2, 5 mM phosphoenolpyruvate, 0.25 mM NADH, 15 units of PK and 20 units of LDH. In the reverse reaction, ATP synthesis was monitored by coupling the reaction to the reduction of NADP in an enzyme-coupled reaction using hexokinase (HK) and glucose-6-phosphate dehydrogenase (G6PD). The standard reaction mixture of 0.5 ml contained 50 mM HEPES-NaOH pH 7.5, 10 mM acetyl-phosphate, 1 mM ADP, 10 mM MgCl2, 5 mM glucose, 1 mM NADP, 10 units each of HK and G6PD. In both the cases, the reaction was initiated by addition of the enzyme and monitored for 10 min at 340 nm. All enzymatic experiments were performed in triplicates at 37°C. The enzyme could be stored for 15 days at 4°C without any significant loss of activity. Kinetic constants for St AckA were determined by fitting the initial velocity versus substrate concentration (six data points covering 0.1-10 K m ) to the Michaelis-Menten equation using GraphPad Prism software (Table 1). Metal requirement of St AckA was examined using the method described by Rose et al.. Briefly, the reaction of the product acetyl-phosphate with neutral hydroxylamine leading to the formation of acetyl-hydroxamate was followed spectrophotometrically, by estimating the formation of a colored complex (ferric-hydroxamate, λmax = 540 nm) in the presence of ferric ions. Putative St AckA inhibitors were tested by incubation (15 min at 25°C) of the enzyme with the compound prior to kinetic measurements. Values reported are mean ± standard deviation from three independent experiments. a Formate, acetate and propionate are shown in parenthesis to indicate that the kinetic constants for ATP were determined in their presence. b Assays were performed with acetate and Mg2+. c Assays were performed with acetate and ATP. d Value of [M] represents ratio of the metal ion w.r.t. ATP, required for the maximum activity. e Value of the [I] represents concentration of the inhibitor required to reduce the catalytic activity of St AckA by 50% at the saturating concentration of cognate ligand. fV app was measured at equimolar concentrations of the substrate and inhibitor. Circular dichroism (CD) spectra of St AckA in the presence of various ligands were recorded using a JASCO J715 spectropolarimeter. The protein concentration was kept at 0.5 mg ml-1 in 5 mM HEPES-NaOH pH 7.5 and 20 mM NaCl in a cell with a path length of 0.1 mm. Thermal denaturation was monitored by recording the CD profile at a suitable wavelength from 20 to 95°C with a rate of 1°C min-1 rise in temperature in a peltier controlled cell holder (JASCO). To study the effect of ligand binding on thermal stability, protein samples were preincubated for 1 h with the selected ligand (at a concentration close to their K m values) prior to denaturation studies using CD. The intrinsic fluorescence of AckA was examined using a Hitachi F-200 fluorimeter and a 1 cm path length cuvette with ~1 μM enzyme in a total volume of 250 μl buffer containing 50 mM HEPES-NaOH pH 7.5 and 200 mM NaCl. Enzyme was titrated with the selected ligand (at a concentration close to their K m values) and the fluorescence spectra were measured after an incubation time of 10 min. Crystallization, X-ray diffraction data collection and initial phase determination of both the St AckA crystal forms have been reported earlier . Interestingly, residues 230–300 (hereafter referred to as the “variable segment”) of Form-II were found to be in a conformation completely different from that of Form-I. These residues were modeled ab-initio using COOT . Briefly, modeling of the variable segment was initiated from both ends of the variable segment. This allowed construction of residues 230–237 and 295–300 in the A-subunit and 230–264 and 277–300 in the B-subunit of Form-II St AckA. Interestingly, unlike Form-I, Cys286 of the B-subunit was found to make an intra-subunit disulfide bond with Cys36. Inspection of the electron density map at Cys36 of A-subunit suggested that a similar disulfide bond is formed in this subunit also. Residues 279–288 of A-subunit could be built around the disulfide bond. Subsequent refinement of the model using REFMAC5  led to further improvement of the electron density map which allowed tracking of the main-chain corresponding to residues 245–246, 277–278 and 289–294 of the A-subunit. Residues 238–244 and 271–276 of A-subunit and residues 265–276 of B-subunit could not be built and are probably disordered. The disordered segments mostly belong to loop regions modeled in Form-I St AckA. Higher B-factors for the variable segment when compared to the rest of the polypeptide reflect the inherent flexibility of this region (data not shown). In the final structure, significant electron density is observed for the modeled residues of the variable segment (Additional file 1: Figure S1). These residues of the variable segment are also well restrained to standard bond distances and angles with 91.5 and 8.5% occupying the most favored and additionally allowed regions, respectively, of the Ramachandran plot. Details of structure refinement and validation statistics for both the crystal forms of St AckA are summarized in Table 2. Refinement and validation statistics are from REFMAC5  and PROCHECK . a Values for the highest resolution shell are given in parentheses. b EDO and CIT refer to ethylene glycol and citrate, respectively. c Rwork = Σ F obs − | F calc | / Σ F obs ; Rfree was calculated similarly by using 5% of the reflections that were excluded from the refinement. d Correlation coefficient = ∑ F o F c − < F o > < F c > / ∑ F 2 o − < F o > 2 ∑ F 2 c − < F c > 2 1 / 2 . Sequence homologs of St AckA were identified in the Swiss-Prot database . DALI  server was used for the identification of homologous structures. Multiple sequence alignment was achieved using ClustalW  and a graphical representation of the alignment as well as superposition of the secondary structures was obtained using ESPript . The Protein Interfaces, Surfaces and Assemblies (PISA)  and Protorp  servers were used for the analysis of dimeric interfaces. HingeProt  and ElNeMo  servers were used to analyze plausible conformational dynamics. Computed Atlas of Surface Topography of proteins (CASTp)  server was used for locating potential ligand-binding cavities. Ligands were modeled at the active site of St AckA by comparison with the ligand bound structure of Mt AckA (PDB:1TUY) , and energy minimized using the CNS program . Molecular figures were created with PyMOL (http://www.pymol.org/). The atomic coordinates and structure factors for the apo (Form-I, PDB:3SLC) and citrate-bound (Form-II, PDB:3SK3) forms of StAckA have been deposited with RCSB. Search for St AckA homologs yielded more than 300 non-redundant sequences belonging to the acetokinase family of enzymes that includes acetate, propionate and butyrate kinases. Acetate and propionate kinases share significant sequence identity (~40%) and both groups possess only a low level of identity with butyrate kinases (~20%, Figure 1). Salmonella typhimurium genome codes for three homologs of acetokinase family; namely AckA (acetate kinase), TdcD (propionate kinase) and PduW (putative acetate/propionate kinase). St AckA shares sequence identities of 41% and 40% with St TdcD and St PduW, respectively. Based on sequence analysis, an enzyme corresponding to PduW of S. typhimurium could not be identified in the closely related E. coli. In both S. typhimurium LT2 and E. coli K12, a gene corresponding to a butyrate kinase could not be detected, suggesting differences in utilization of SCFA in microorganisms. Sequence analysis of acetokinase family of enzymes. Multiple sequence alignment of St AckA with known structures belonging to acetokinase family. 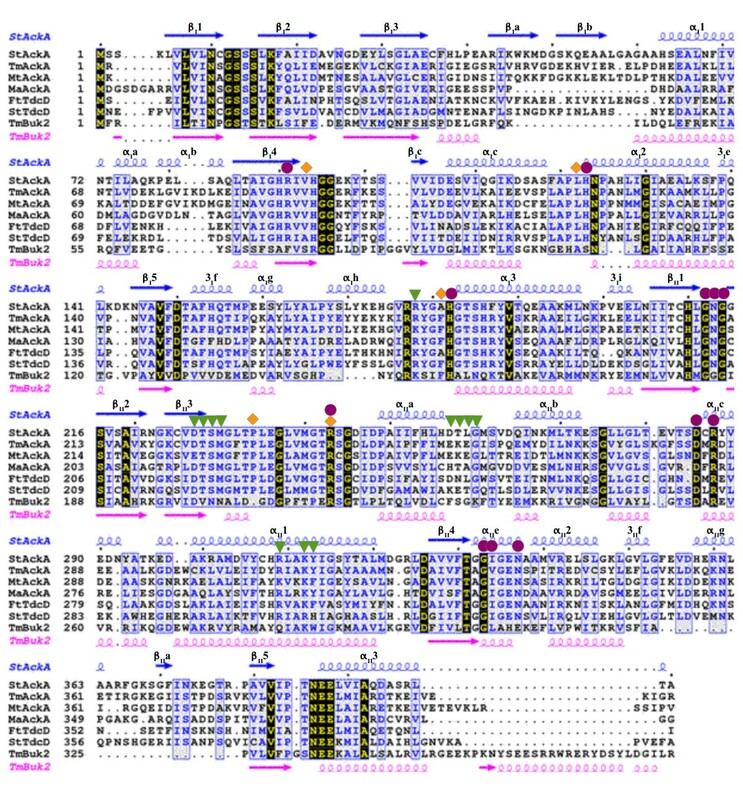 Sequence code: St AckA, S. typhimurium AckA; Tm AckA, Thermotoga maritima AckA; Mt AckA, Methanosarcina thermophila AckA; Ma AckA, Mycobacterium avium AckA; Ft TdcD, Francisella tularensis putative acetate/propionate kinase; St TdcD, S. typhimurium propionate kinase; Tm Buk2, Thermotoga maritima butyrate kinase 2. All sequences are numbered at the beginning of each block of aligned sequences. St AckA numbering is indicated by every 10 residues using a dot symbol on top of the alignment. Secondary structures of Form-I St AckA and Tm Buk2 (PDB:1SAZ) aligned onto their respective sequences are also shown (refer Figure 3A for secondary structure labeling scheme). Colour code: strictly conserved residues are shown in yellow with black background; highly similar regions are shown in blue with grey background. Putative acetate and nucleotide binding residues are marked with orange rhombi and magenta circles, respectively. Residues interacting with citrate in Form-II St AckA structure are highlighted by green triangles. Earlier studies on SCFA specificity of AckAs have led to conflicting reports [5, 9]. In the present study, the recombinant St AckA was purified to homogeneity using Ni-NTA affinity chromatography followed by gel-filtration. The preliminary enzymatic assay with acetate, ATP and Mg2+ as substrates showed that the St AckA catalyzed reaction follows Michaelis-Menten kinetics with pH and temperature optima in the range of 7.2-7.5 and 35–37°C, respectively (Figure 2). This highly purified, stable and active preparation of St AckA was further used to examine the kinetics of phosphoryl transfer reaction from ATP to various SCFA substrates viz. formate, acetate, propionate and butyrate. It was observed that St AckA could catalyze phosphate transfer at significant rate from ATP to formate, acetate and propionate (Table 1). However, butyrate was not found to be a suitable substrate. In addition, the presence of butyrate at equimolar concentration reduced the catalytic rate of acetate utilization by 40%, which might suggest competitive binding of butyrate at the SCFA binding site. Further, kinetic analysis showed that the K m is nearly 10 times lower for acetate when compared to formate or propionate (Table 1). As maximum velocity and catalytic turnover numbers (k cat ) were found to be similar for these substrates, the catalytic efficiency (k cat /K m ) for acetate was ~10 times higher than for formate or propionate, indicating that acetate is the preferred substrate. Noticeably, the enzyme showed similar K m and k cat values for ATP when either formate, acetate or propionate was used as the SCFA substrate (Table 1). Further kinetic characterization revealed that St AckA catalyzes the reverse reaction i.e. phosphoryl transfer from acetyl-phosphate to ADP much more efficiently (Table 1). The K m for ADP and ATP are comparable whereas the K m for acetyl-phosphate is significantly lower compared to that for acetate. Enzymatic characterization of St AckA. Plot of enzyme activity (%) at various (A) pH and (B) Temperature values. (C) Profile of saturation kinetics exhibited by St AckA with acetate as substrate. The biochemical investigations were further extended for assessment of nucleotide analogs as phosphoryl donors in St AckA catalyzed reaction. These kinetic assays showed that apart from ATP and GTP, consistent with reports from Fox & Roseman , St AckA could also utilize pyrimidine bases such as UTP and CTP with comparable affinities (Table 1). Activity of St AckA was found to be completely abolished in the presence of EDTA (5 times Mg2+ concentration) or in the absence of suitable divalent ions, suggesting that divalent cations are essential for the catalysis. In addition to MgCl2 (V max = 100%), the enzyme could be activated by MnCl2 (V max = 100%), CoCl2 (V max = 15%) and to a minor extent by NiCl2 (V max = 5%) (Table 1). However, several other divalent (CaCl2, FeCl2, CuCl2, ZnCl2, CdCl2 and HgCl2) and monovalent (LiCl or CsCl) ions failed to activate the enzyme. A divalent metal-ion ratio of 1:1 with ATP appeared to be optimal while a large excess (>25 times) of Mg2+ relative to ATP was found to reduce the catalytic rate, which might suggest that free Mg2+ could inhibit the binding of catalytically competent ATP-Mg2+ complex to the enzyme. Crystal structures of two archeal acetate kinases, from Thermotoga maritima (PDB:2IIR, unpublished results) and Methanosarcina thermophila and one from Mycobacterium avium (PDB:3P4I, unpublished results) have been determined earlier. However, structures of AckA from mesophiles such as S. typhimurium, or the closely related E. coli were not available. To obtain molecular insights into the mesophilic AckA, we determined the crystal structure of St AckA at 2.70 Å resolution (Form-I, Figure 3) by molecular replacement using a polyalanine model of the Tm AckA (PDB:2IIR, unpublished results) monomer as the search model. The asymmetric unit (ASU) of Form-I St AckA crystal consists of four nearly identical protomers, as indicated by the low root mean square deviations (rmsd) of corresponding Cα atoms (0.43-0.84 Å for >350 target pairs). St AckA protomer consists of 22 helices (160 residues, 41.2%), 14 β-strands (77 residues, 19.8%) and loop regions (151 residues, 38.9%; Figures 3A and B). As in the homologous archeal enzyme , each subunit could be further divided into N-terminal (Domain-I, residues 3–152 and 386–400) and C-terminal (Domain-II, residues 153–385) domains. The α-helices present at the carboxy-terminal ends of both the domains extend to form part of the other domain. Structure of Form-I St AckA. (A) Tertiary structure of St AckA illustrating the N- (domain-I) and C-terminal (domain-II) domains of the enzyme. The core secondary structural elements (βββαβαβα) are shown in green (strands) and cyan (helices), while insertions of subdomains between secondary structural elements are highlighted in magenta (strands) and yellow (helices). Secondary structural elements of the core are numbered αI1, αI2… for α-helices, 3I1, 3I2… for 310 helices, βI1, βI2… for β-strands in domain-I and as αII1, αII2… for α-helices, 3II1, 3II2… for 310 helices, βII1, βII2… for β-strands in domain-II. Insertion domains are indexed similarly and numbered alphabetically. N- and C- termini of the subunit are also marked. (B) Topology diagram of St AckA indicating the ASKHA core fold and the location of the five conserved motifs. Arrows represent β-strands while cylinders represent helices, respectively. The coloring and secondary structure labeling scheme is similar to that of Figure 3A. (C) Dimeric structure of St AckA. The approximate size of a dimeric unit is 84 x 83 x 69 Å3. A-subunit of the dimer is illustrated using the same colouring scheme to that of Figure 3A. Domain-I and -II of the B-subunit are shown in grey and brown, respectively. The dimer is mainly held by interactions between the C-terminal domains (domain-II) of the two subunits, while domain-I of each subunit protrudes out of the body of the dimeric enzyme. The 2-fold axis is highlighted by dotted line. Secondary structures corresponding to the core helices are labeled. The four subunits of St AckA present in the ASU are further organized as two dimers resembling the dimeric structure of the archeal enzymes . The two dimers of the asymmetric unit could be superposed with Cα rmsd of 0.50 Å for 706 target pairs suggesting that the organization of the protomers in the two dimers are essentially identical. The subunits of a dimer are related by nearly perfect non-crystallographic two-fold symmetries (Figure 3C). The accessible surface area (ASA) of an St AckA monomer was found to be 17,920 Å2 and upon dimerization approximately 3,061 Å2 (17% of total ASA) per subunit gets buried. Several segments of domain-II (αIg, αIh, αIIa, αIIb, αII1 and 3IIf and f*) contribute to the dimeric interface. A total of approximately 81 residues (20% of total surface residues), of which 23% are polar, 53% are non-polar and 24% are charged, contribute to the interactions at the interface leading to approximately 23 hydrogen bonds and 8 salt bridges. There are also a few water-mediated hydrogen bonds between the two subunits of the dimer. This analysis indicates a stable dimeric interface. A cleft between the two domains forms the active site pocket of St AckA. 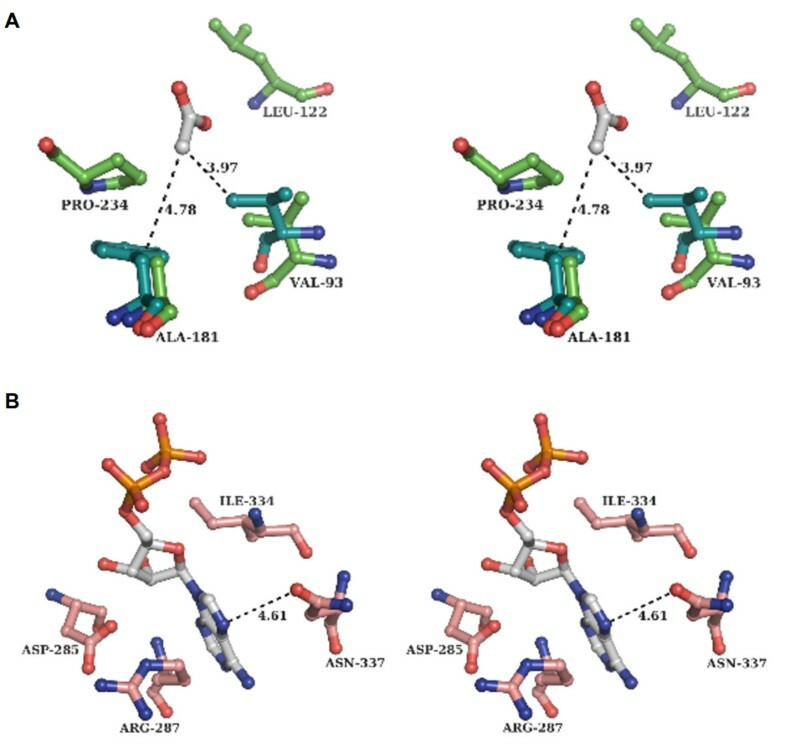 Structural comparison with the ligand-bound Mt AckA structures [15, 16] allowed identification of residues likely to be important for acetate (Val93, Ala181, Leu122, Pro234 and Arg243), nucleotide (Arg91, His123, His182, Gly212, Asn213, Gly214, Arg243, Asp285, Arg287, Gly333, Ile334 and Asn337) and metal-ion (Asn10, Lys17, Asp150, Glu387) binding by St AckA. These residues are also conserved in other members of acetokinase family (Figure 1), indicating their shared ligand binding modes and catalytic mechanisms. As observed from kinetic measurements, St AckA could catalyze phosphoryl transfer to formate, acetate and propionate but not to butyrate (Table 1). Despite several attempts, crystals of ligand bound enzyme could not be obtained either by co-crystallization or soaking. Therefore, based on the acetate-AlF3-ADP bound structure of Mt AckA , formate, acetate, propionate and butyrate were modeled into the active site of the Salmonella enzyme. As anticipated, acetate could be accommodated with favorable interactions (Figure 4A). Although formate could also be accommodated, it made fewer interactions when compared to that of acetate while the additional methyl group of propionate (as compared to acetate) formed a short contact with Val93 of St AckA. This short contact could however be relieved by a small conformational adjustment of Val93 or by pointing the extra methyl-group of propionate towards Ala181, which is a semi-conserved residue and is mostly replaced by phenylalanine in acetokinases (Figures 1 and 4A). The aromatic ring of this phenylalanine bends away from the active site pocket and thus effectively presents a hydrophobic environment equivalent to that of alanine towards the SCFA binding site (Figure 4A). Similar adjustment with butyrate was not possible as the short contacts with Val93 and Ala181 could not be relieved by small conformational adjustments that would allow the reactive group of butyrate to be oriented appropriately for catalysis. Molecular basis for the substrate and nucleotide specificity of St AckA. (A) Stereo diagram of SCFA binding residues (lime-green) of St AckA with modeled acetate (grey). For comparison, a few superposed residues (teal) of Mt AckA are also shown. (B) Stereo diagram of the putative nucleotide-binding residues (salmon-red) of St AckA and modeled ADP (grey). Distances shown with dashed lines are in Å. Similarly, modeling of nucleotides was carried out based on the acetate-AlF3-ADP bound structure of Mt AckA . The analysis revealed that the enzyme interacts with the nucleotide base mainly by hydrophobic interactions (Figure 4B). Absence of directional ionic interactions with nucleotides could account for the broad nucleotide specificity of the enzyme. Although it is likely that AckA is primarily an ATP-dependent enzyme, the broad specificity will allow other nucleotides also to support acetate utilization. Proteins belonging to ASKHA superfamily have been suggested to undergo inter-domain motion upon ligand binding [30–33] (Figure 5A). In the present study, ligand binding to St AckA was examined by monitoring the thermal stability of the enzyme using CD spectroscopy. The unliganded enzyme showed a melting temperature (Tm) of 45°C at which 50% of the enzyme was unfolded. An increased Tm was observed with the addition of acetate (50°C), acetyl-phosphate (54°C), ADP (52°C) and ATP (52°C), suggesting that the protein becomes more stable upon ligand binding. Noticeably, St AckA contains a single tryptophan (Trp46) residue, which is located in domain-I at a large distance (20 Å between Cα of Trp46 and Asn213, a residue involved in binding of nucleotide phosphates) from the active site. This allows monitoring of conformational transition induced upon ligand-binding by measuring fluorescence quenching due to the change in the tryptophan environment. Intrinsic fluorescence spectra of St AckA recorded in the presence of acetate, acetyl-phosphate, ADP and ATP showed quenching as compared to the unliganded enzyme (Figure 5B), thus indicating that binding of these ligands is likely to result in conformational transitions that may involve inter-domain movement. Conformational changes induced upon ligand-binding in AckAs. (A) Structural comparison of A-subunit of Form-I St AckA (apo, pink) with open (yellow) and closed (cyan) subunits of Mt AckA (PDB:1TUY). A large movement in domain-I (moving domain) relative to the domain-II (fixed domain) could be observed. Regions connecting the two domains are represented by the putative hinge residues (Ala152 and Thr385). N- and C-termini as well as secondary structures corresponding to the core helices are labeled. (B) Influence of ligand binding on the intrinsic fluorescence (excitation: 280 nm, emission: 300–400 nm) of St AckA. Another crystal form of St AckA (Form-II) was obtained in the presence of citrate . The structure of this form was determined at 1.90 Å resolution using a polyalanine model of the Form-I St AckA monomer. Although the overall polypeptide fold in these two forms is similar, residues 230–300 (variable segment) were in significantly different conformations in the two subunits of Form-II dimer and these conformations in turn were different from that observed for this segment in Form-I (Figure 6A). Superposition of A- and B-subunits of Form-II St AckA with the A-subunit of Form-I St AckA excluding the variable segment results in rmsds of 1.03 Å and 1.53 Å for 326 and 313 pairs of Cα atoms, respectively (Figure 6B). The variable segment is located between strand βII3 and helix αII1 (Figures 3A and B). In the A-subunit of Form-II, residues 230–237 and 247–255 are at a location close to the corresponding region of Form-I St AckA (Figure 6B). However, position and conformation of residues 258–270 and 277–294 are completely different from those of Form-I. The segment consisting of residues 230–263 of the B-subunit of Form-II is initially close to the corresponding segment of Form-I but progressively departs from the structure observed in Form-I towards the C-terminal end. Residues 277–287 of B-subunit are close to the active site cleft present between the domains and occupy the space where ligands are expected to bind. Comparison of Form-I and -II St AckA. (A) Plot of residual distance between sequentially equivalent Cα atoms against residue number obtained after pairwise superposition of A-subunit of Form-I and A- and B-subunits of Form-II St AckA. Labeling scheme – e.g. IIA-IIB corresponds to distances between equivalent Cα atoms after superposition of Form-II B-subunit on Form-II A-subunit. The insets show the variable segment (residues 230–300) Cα atom distances highlighting large conformational differences (corresponding to ~18% of the total length of the enzyme). Region corresponding to residues 251–260 (refer Additional file 1: Figure S1 for fit of the electron density) are marked by vertical dotted lines. (B) Structural superposition of the A-subunit of Form-I (salmon-red) with A- (yellow) and B- (cyan) subunits of the Form-II St AckA highlighting the structural differences of the variable segment. Secondary structures corresponding to the core helices and variable segments (labels corresponding to I-A, II-A and II-B subunits are enclosed using ○, □ and Δ shapes, respectively) are labeled. Met230 and Lys300 occur at the ends of the variable segment. (C) Form-II St AckA dimer highlighting regions of variable segment (A-subunit, yellow except for the variable segment shown in bright-orange; B-subunit, cyan with variable segment highlighted in blue). Citrate (pink, CIT-501) bound at the dimeric interface is shown in ball and stick representation. Secondary structures corresponding to the variable segments of each subunit are labeled. The three conformationally distinct subunits (subunits of Form-I and A- and B-subunits of Form-II) also show variations in the degree of domain closure. B-subunit of Form-II represents the most closed state while A-subunit represents a conformation between those of Form-I and B-subunit of Form-II (data not shown). Despite the large conformational differences in the variable segment and inter-domain closure, structures of other segments are largely retained (Figures 6A and B) and the dimeric nature is preserved in Form-II (Figure 6C). The residues in the variable segment of Form-I are involved in inter-subunit interactions. This leads to reduction in the buried surface area (1,996 Å2 compared to 3,061 Å2 of Form-I) and ionic interactions (hydrogen bonds = 12; salt bridges =13 compared to 23 and 10, respectively, of Form-I) of the dimeric interface between the subunits (ASA of Form-II St AckA monomer: 17,235 Å2) of Form-II. As the residues of the variable segment are also involved in the formation of active site pocket, Form-II structure is not suitable for binding nucleotides and therefore may represent an inhibited state of the enzyme. Examination of the difference electron density map of Form-II St AckA showed significant uninterpreted density located at the dimeric interface that was distinct from that of the polypeptide chain. Citrate, a component of the crystallization condition, was found to best fit the density (Figure 7) and could be refined with reasonable B-factors (33.9 Å2) and occupancy (0.75). Interestingly, only one citrate binds at the dimeric interface resulting in an asymmetric dimer. Citrate occupies a highly polar and charged environment. It interacts with atoms (distance cutoff: ≤5.0 Å) of residues Arg178, Asp227, Thr228, Ser229, Met230, Asp257, Thr258, Leu259, Gly260, Arg309, Lys312 and Tyr313 of the A-subunit and Arg309, Lys312 and Tyr313 of the B-subunit. Some of the residues that interact with the citrate are from the amino-terminal end of the variable segment and hence the conformational differences between the two subunits observed in the Form-II structure could be due to citrate binding. Inspection of Form-II St AckA protomer structure revealed a shallow cavity at the site of citrate binding (Figures 8A and B). In the dimeric structure, these cavities coalesce, forming a larger pocket suitable for ligand binding (Figure 8C). 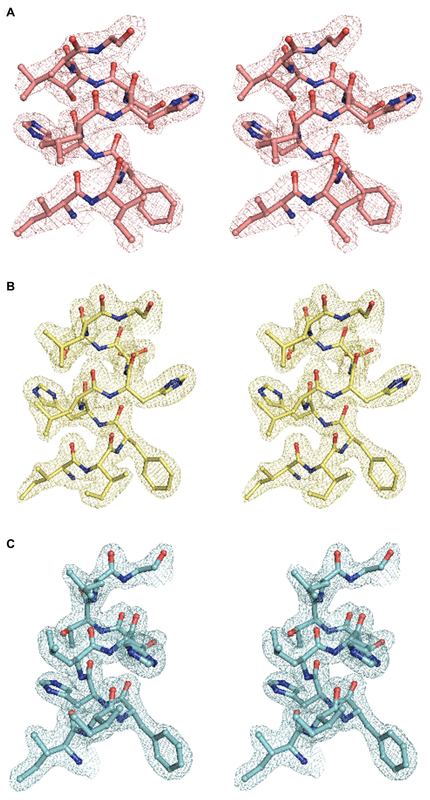 Intriguingly, examination of Form-I St AckA as well as other structurally known members of acetokinase family (Table 3) revealed a similar cavity at the dimeric interface (Figure 8C and Additional file 2: Figure S2). As many of the residues (Arg178, Asp227, Met230, Arg309 and Tyr313; St AckA numbering) lining the cavity are highly conserved across acetokinases (indicated by green triangle in Figure 1), the dimeric interface pocket observed for the first time in Form-II St AckA could be involved in binding of a putative ligand that might influence the activity of the enzyme. a Identity and RMSD correspond to the comparison of the query protein with St AckA Form-I dimer (St AckA-I-AB). b Due to continuity between the dimeric interface pocket and the active site cavities of A- and B-subunits in Form-II St AckA (Additional file 2: Figure S2C), volume of dimeric interface pocket in Form-II is not well defined. cSt TdcD dimer (A' indicates symmetry relation with A) was generated using the crystallographic 2-fold axis. d The originally published paper by Diao and Hasson (2009) has been retracted by the publisher for data ownership issues. Acetate kinase is ubiquitously present in bacteria and archea  and appears to be absent in humans . As AckA is involved at the junction of carbohydrate and fatty acid metabolism, it might be a suitable target for development of inhibitors . We have earlier structurally and biochemically characterized Salmonella typhimurium propionate kinase (St TdcD) and demonstrated that the enzyme is specific to propionate although could utilize acetate at a 10 times lower rate [13, 35]. In the present study, we report structural and mechanistic investigations of St AckA. Among the SCFAs tested, acetate was the preferred substrate although the enzyme showed significant activity with formate as well as propionate (Table 1), which is consistent with the physiological function of the enzyme in acetate metabolism. On the other hand, affinity for various nucleotides were comparable (Table 1). Modeling studies revealed that interactions with the nucleotide occur mainly through the base moiety with minor contribution from the phosphates, which is in agreement with the comparable K m obtained for ADP and ATP for St AckA (Table 1). The observed broad specificity of St AckA is suggestive of its primitive origin which might have been crucial for the survival of ancestral cells that functioned with limited resources. Interestingly, St AckA could catalyze the reverse reaction (ATP formation) more efficiently when compared to the forward reaction (acetyl-phosphate synthesis) (Table 1). This could serve as a major source of energy during anaerobic growth of S. typhimurium. The structure of ADP-AlF3-acetate complex of Mt AckA [15, 16] reveals that the phosphate is likely to bind at a deeper site in the active site pocket with acetyl moiety occupying an exterior site. The phosphate is likely to form significant interactions with the protein and contribute to the higher affinity for acetyl-phosphate when compared to acetate (Table 1). DALI search  revealed significant similarities of St AckA with over 100 non-redundant (90% sequence identity cut-off) structures deposited in the PDB. 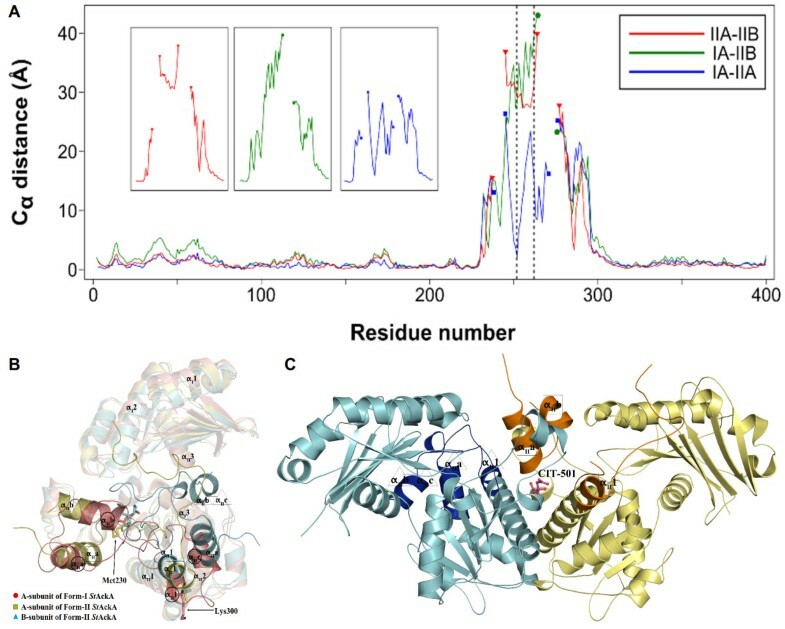 These structurally similar domains include not only kinases but also several other proteins with diverse functions such as transcriptional regulator ROK family homolog of E. coli MLC protein (2GUP/3.9 Å/11%), O-sialoglycoprotein endopeptidase (2IVN/4.2 Å/14%), actin (3B63/4.6 Å/11%), cell division protein FtsA (1E4G/4.1 Å/11%), plasmid segregation protein ParM (3IKY/4.2 Å/10%), diol dehydratase-reactivating factor large subunit (2D0O/4.6 Å/10%), activator of 2-hydroxyglutaryl-CoA dehydratase (1HUX/4.3 Å/15%), glycerol dehydratase reactivase α-subunit (1NBW/4.6 Å/12%), heat shock 70 kDa protein (3FZF/5.4 Å/10%), rod shape-determining protein MreB (1JCF/4.0 Å/10%), ethanolamine utilization protein EutJ (3H1Q/3.8 Å/14%) and a few other proteins of unknown function (corresponding PDB code, rmsd of Cα atoms upon superposition with St AckA, and sequence identity with St AckA are shown in parentheses). 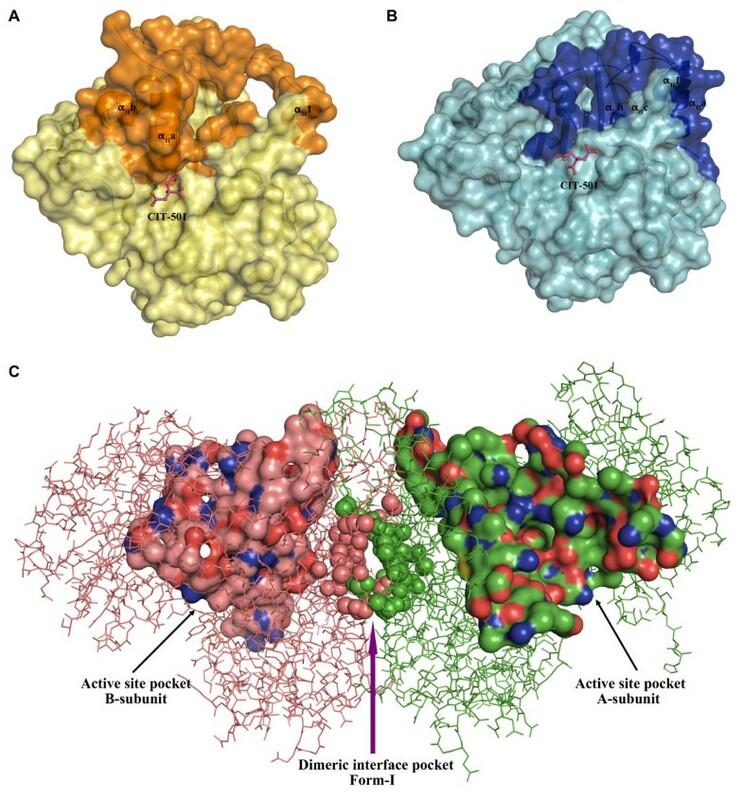 This remarkable structural and functional versatility is comparable to that of the well-known TIM-barrel proteins and is consistent with biochemical studies that suggest emergence of AckA fold early in evolution. Although no overall sequence similarity between Acetate and Sugar Kinases/Heat shock cognate (Hsc) 70/Actin (ASKHA) superfamily could be detected, these proteins typically bind ATP and contain a duplicated core with βββαβαβα topology that harbors five highly conserved motifs ( Adenosine, Phosphate-1, Phosphate-2, Connect-1 and Connect-2)  (Figure 3). The N- and C- terminal domains of ASKHA superfamily of proteins could be further divided into two subdomains. The N- and C-terminal conserved subdomains conform to the βββαβαβα topology while variable subdomains are constituted by insertions (Figures 3A and B) that may account for the functional diversity of these proteins. Among acetokinase family, a characteristic insertion corresponding to residues 150–180 of St AckA is present before αI3 of domain-I (Figures 3A and B). This segment contains a few α- and 310-helices, which form part of the dimer interface. Another unique insertion (residues 354–377 of St AckA) in acetate and propionate kinases is found between αII2 and βII5 of domain-II. In St AckA, the insertion consists of an additional β-strand (βIIa) that extends the central β-sheet, an α-helix (αIIg) and two 310 helices (3IIf and 3IIf*). This insertion is not found in butyrate kinase. Also, the sequence of the inserted segment is not well conserved between acetate and propionate kinases. As residues from this region interact with the base of the nucleotide, the insertion may be significant for mechanistic differences within the acetokinase family of enzymes. Availability of several acetokinase structures from mesophilic (Form-I St AckA; S. typhimurium propionate kinase (St TdcD), PDB:2EIY; Francisella tularensis acetate/propionate kinase (Ft TdcD), PDB:3KHY and Mycobacterium avium acetate kinase (Ma AckA), PDB:3P4I) as well as thermophilic (Mt AckA, PDB:1 G99; Thermotoga maritima acetate kinase (Tm AckA), PDB:2IIR and Tm Buk2, PDB:1SAZ) organisms in PDB allows analysis of features that might contribute to the enhanced stability of AckA homologs found in thermophiles. Analysis of amino acid composition of these proteins revealed that the protein surfaces in thermophilic AckA homologs have a larger number of charged residues and a smaller number of polar residues when compared to mesophilic counterparts. Solvent exposed surface of thermophilic Mt AckA contains 23% polar, 40% non-polar and 37% charged residues compared to 30% polar, 39% non-polar and 31% charged residues, respectively, of mesophilic St AckA. The increase in charged residues on the surface of the thermophilic proteins results in enhanced intra-subunit ionic interactions (salt bridges: St AckA = 12; Mt AckA = 23). Also, an excess of hydrogen bonds (St AckA = 23; Mt AckA = 32) and salt-bridges (St AckA = 8; Mt AckA = 19) in the dimeric interface provides additional stability to the thermophilic enzymes. Thus, the thermophilic proteins of acetokinase family seem to achieve stability by a large number of intra- and inter-subunit ionic interactions. Superposition of Form-I St AckA with protomers of Mt AckA structure (PDB:1TUY) revealed that St AckA is in a conformation intermediate to that of the open and closed states of Methanosarcina enzyme (Figure 5A). In order to gain insights on plausible domain motion, St AckA and Mt AckA were subjected to normal mode analysis using the ELastic NEtwork MOdel (ELNEMO) server. 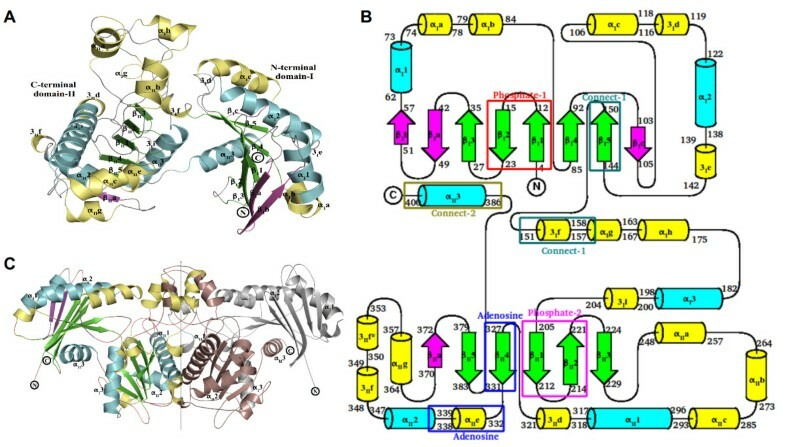 The analysis revealed conformations of St AckA that were similar to both the open (Cα rmsd: 1.15 Å) and closed (Cα rmsd: 1.23 Å) states of Mt AckA subunits, and in conjunction with fluorescence studies (Figure 5B), suggests that St AckA is also compatible with the inter-domain movements as observed in Mt AckA. It is possible that the structure of Form-I St AckA protomer represents an intermediate state in which the active site is accessible to the solvent and ligands. The closed form may represent the active site geometry required for catalysis. The open form may facilitate expulsion of product by reducing the interactions that stabilize the bound ligands. The most intriguing result of the present investigations is the rearrangement and partial disorder observed in a large segment (residues 230–300) of the Form-II polypeptide (Figures 6A and B). Despite the disordered nature, modeled residues of the variable segment possess significant electron density (Additional file 1 Figure S1) and show well restrained stereochemistry . Examination of the electron density revealed the presence of a citrate molecule bound at the dimeric interface (Figures 6C and 7) and led to the identification of a putative ligand binding pocket in acetokinase family of enzymes (Figure 8 and Additional file 2: Figure S2). AckA is an important enzyme that could play a key role in controlling the flux of metabolites in several pathways including glycolysis, gluconeogenesis, TCA cycle, glyoxylate bypass and fatty acid metabolism [2, 3, 6–8, 10, 11]. Examination of the thermal stability of St AckA incubated with 10 mM citrate showed an increase in Tm (55°C) by 10°C consistent with the binding of the ligand. However, at this concentration of citrate, no change in the activity of St AckA was observed. Therefore, it is possible that some other metabolite of these pathways bind at the putative dimeric interface pocket and regulate the enzyme activity. In this regard, some of the metabolites of TCA cycle and their analogs were tested for inhibition of St AckA, of which malate was found to inhibit the enzyme maximally (Table 1). Further investigations on the nature of inhibition and similar studies with other members of acetokinase family enzymes might reveal the physiological significance of such a ligand-binding pocket. Biochemical studies on St AckA suggested that the preferred substrate of the enzyme is acetate. The enzyme showed significant catalytic rates with formate and propionate but did not utilize butyrate as a substrate. The kinetic characterization further revealed broad specificity of the enzyme with respect to nucleotides and metal ions. Structure of Form-I St AckA determined in the present study represents the first report of an unliganded as well as mesophilic AckA. 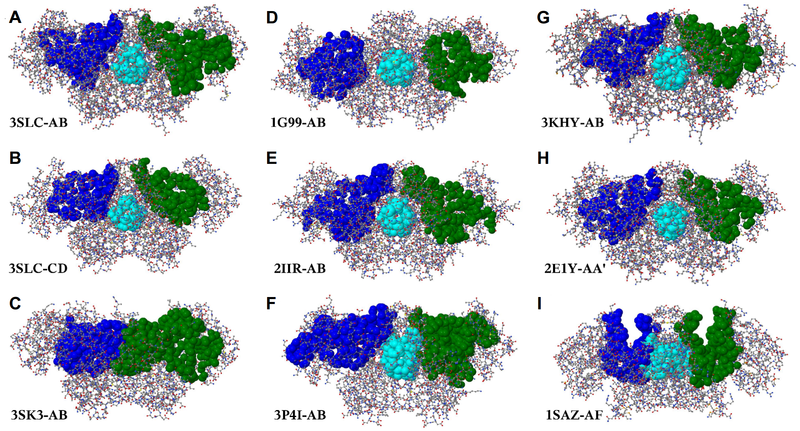 Biophysical studies of St AckA and comparison with other AckA homologs provided insights into the mechanism of ligand binding, domain motion and thermal stability in AckA family of enzymes. In Form-II St AckA, we observed completely unexpected conformational differences in a large segment of the polypeptide between the two forms. This lead to the serendipitous identification of a conserved ligand binding pocket at the dimeric interface of St AckA and its homologs that could form a basis for further mechanistic investigations of this family of enzymes. Acetate and sugar kinases/heat shock cognate (Hsc) 70/Actin. The authors would like to thank James and Babu of X-ray facility at the Molecular Biophysics Unit, Indian Institute of Science (IISc), and Dr. Hassan Belrhali and Dr. Babu Manjasetty of beamline BM14 at European Synchrotron Radiation Facility (ESRF), France for the assistance during X-ray diffraction data collection. We thank Chhavi Mathur for critical reading of the manuscript. This work was supported by the Department of Science and Technology (DST) [grant number SR/SO/BB-47/2009 (to MRN and HSS)] and Department of Biotechnology (DBT) [grant number BT/PR10912/BRB/10/630/2008 (to MRN and HSS)], Government of India; the Council for Scientific and Industrial Research (CSIR), Government of India, and IISc fellowships to SC. MRN and HSS conceived and supervised the project. SC performed the experiments, analyzed the data and wrote the paper. All authors have read and approved the final manuscript.